My name is Andi Wahyu, but I love if you call me Randy. I was born and raised in a small mining town in Indonesia surrounded by tropical forests, an ancient lake, and mountains. My childhood memories and surrounding landscape help me in creating aquascapes. 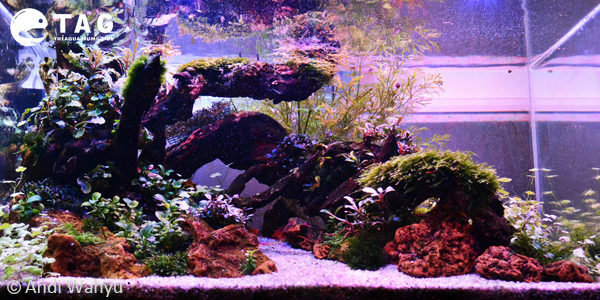 I started aquascaping in 2011 when I was a Telecommunications Technician, which is a tough and stressful job. I decided to find something to lessen the pressure placed on me by my job and found this hobby. 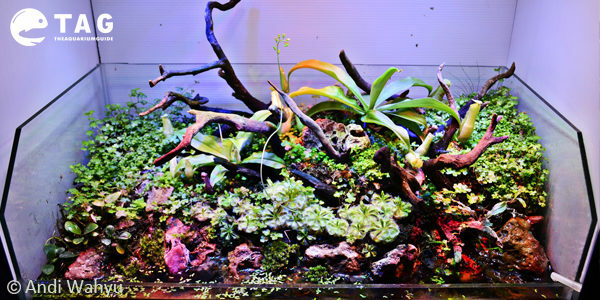 I like all of the styles, but my favorites are Nature, Iwagumi, and mountain aquascapes. I’m a little obsessed with my childhood memories and hometown scenery in my aquascapes. 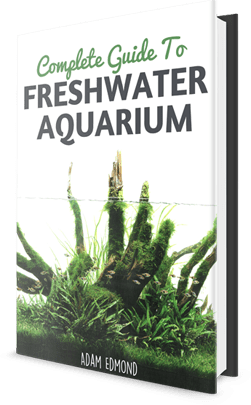 Find out more about the different style of aquascaping via my infographic. It’s easy to find inspiration right now, especially in landscape photographs and aquascape online contests. I also research professional aquascapers on the Internet to draw motivation from their work. 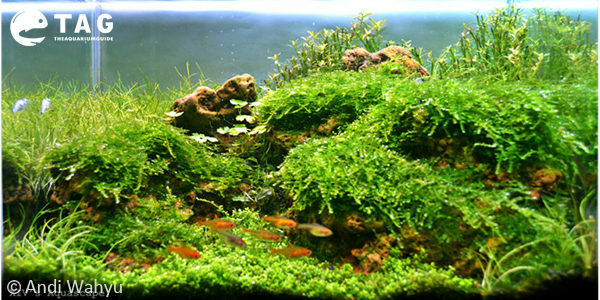 I like HC Cuba, Bucephalandra, and mosses such as fissiden fontanus, which fit in many aquascape styles. As for fish, I like ottocinclus affinis, but my favorite is ember tetra because they are sturdy and a nice schooling fish. I also like shrimp; my hometown has an ancient lake that is home to the most beautiful shrimp like celebes beauty, white spot, yellow check, yellow nose, tigri, white orchid, and others; however, it’s very difficult keeping those types of shrimp in aquariums. 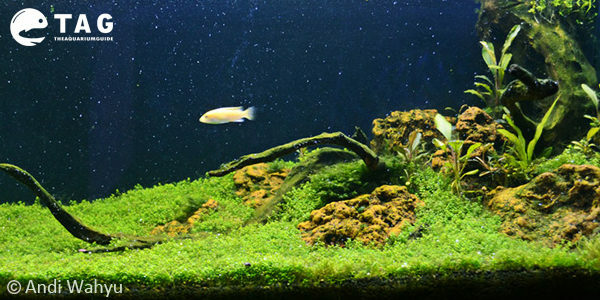 Right now, I’m maintaining two aquascapes and two paludariums. My first tank, a 19-gallon nature style aquascape with a dimension 60x35x35cm, is set in my living room. I have planted easy plants like buchepalandra, anubias petite, peacock moss, fissiden fontanus, hydrocotil tripartita, lilaeopsis braziliensis, and pinnatifida for this tank. I’m using santigi wood and celebes stone for the hardscape, silika sand for the substrate, and UGF filter powered by 500L/H pump. The second tank is located in my hobby room and is a 6-gallon mountainscape style with dimensions of 30x30x25. Currently, I’m planting monte carlo and fissiden fontanus. The hardscape is celebes stone while the substrate is ADA Amazonia and the filter is eheim 2213. 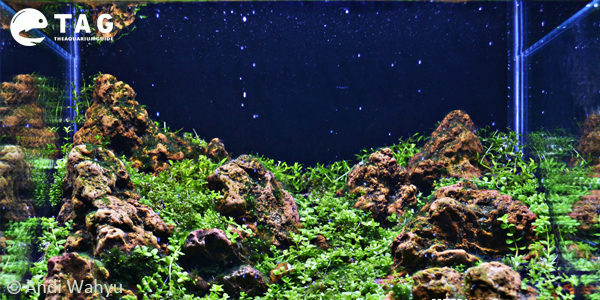 I am also starting my third aquascape—a 52-gallon tank with 90x55x40cm dimensions. I also have a carnivorous plant paludarium and a mountain style paludarium. All of my tanks and paludariums use DIY High Power LEDs, EI for the fertilizing, 5kg CO2 cylinder, and 50% water change weekly. 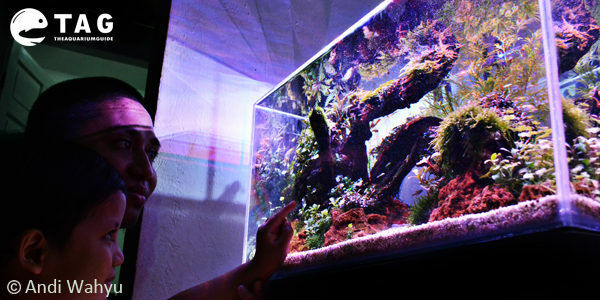 Aquascaping has become very popular in Indonesia. 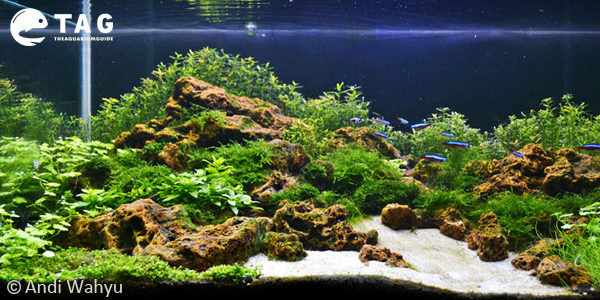 There are multiple aquascaping contests in Indonesia right now and we have an aquascaping forum: indoaquascape.com. In addition, many Facebook groups and talented aquascapers, such as Wendy Kurniawan and Arif Hamsa, teach, share, and encourage their knowledge to all Indonesian aquascapers. Also, talk to other aquarists, either in person or on the Internet, for ideas and help. You can find all of my work on my website or on my Facebook profile.